"An apology for the devil: it must be remembered that we have heard only one side of the case. God has written all the books." "Christian doctrine was shredded to pieces by biblical scholars in the 18th and 19th centuries, but the information didn't get out to the bulk of the people..."
"Strictly speaking, there is no such book [as the Bible]. To make the Bible, sixty-six books are bound into one volume. These books are written by many people at different times, and no one knows the time or the identity of any author." While many parts of this site can stand alone, this section is uniquely dependent on the previous one. The previous question was a critical prerequisite to understanding that document dating, like archaeology, is an ongoing process of refinement. With that understanding, we can proceed to examine what just might be the best set of dates to come out of twentieth-century study for the books of the Bible. The scholarly work herein is credited mostly to R.K. Harrison, Gleason Archer, and F.F. Bruce. Of course, even their work may be subject to further refinement in the future. Confirming the author of each biblical book will not be dealt with here as it's not as important as discovering when the books were written. Authorship is of lesser importance because the chief appeal of Jesus' divinity by first century Christians, as by many today, was Jesus' fulfillment of Old Testament prophecy. It is therefore far more important to place dates on those prophecies than to identify who spoke them (though many of those identities are confidently established). So by establishing the dates of the Old Testament works, we can then know that the prophecies of Christ's appearance were written long before the fact, not afterwards. 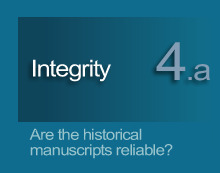 4.2 The effect of the Enlightenment on document dating. One method of establishing dates for scriptural writings which was popular several hundred years ago entailed counting the generations of descendants mentioned in the Bible and then calculating backwards. This method assumed the completeness of the genealogies in the Massoretic copies of Scripture (the earliest biblical documents available at that time). It also assumed the listed descendants were not just representative of larger genealogies (some were). Authorships were simply taken at face value (e.g. Jeremiah wrote Jeremiah) or upon rabbinical tradition (Jeremiah also wrote 1 & 2 Kings). In the eighteenth and nineteenth-centuries, a period also known as the Enlightenment, the emphasis on rationalism came to seriously challenge the validity of this dating method as well as the believed authorship of many of the writings. It is during this period that doubt was stirred up about the age and authorship of the biblical writings. This doubt was so embraced by critics of that time that even today emerging archaeological facts on the authenticity of Scripture are refused consideration by those wishing to remain content with nineteenth century conclusions. 4.3 Scholarship of the Enlightenment. -- WHAT WAS THE ENLIGHTENMENT? The Enlightenment was a period of multi-faceted change mainly from the late seventeenth to the late nineteenth-century. Typical of historical paradigm shifts, there were a number of factors that shaped this period; one of which were Isaac Newton's scientific laws. His simplification of basic mechanical principles in an earlier era had given rise to a philosophical direction called mechanism or determinism. Determinism basically viewed the universe as an enormous but fundamentally simple mechanism that could be completely understood with mathematics. This manner of thinking seemed to provide an empirical basis for deists who believed that God existed in some remote form, but not in an intimate closeness as described in the Bible. The Bible's more personal view of God was the previously more popular belief in the western world (which Newton himself held). Over the years, the tremendous success of Newton's laws in predicting the behavior of objects in motion progressively supported the idea that formulae and theories could be equivocated to actual facts. The most recognizable of such equivocations is that of evolution. Belief that human life evolved from lower forms of life was initially most prevalent in France and Germany. The theory of evolution helped catapult a revolution in the former, and reshaped both science and philosophy in the latter. As a consequence to France and Germanys' popular acceptance of evolutionary theory as fact, from those same nations arose a similar theory of formation concerning the Bible. If God is nonexistent, or at least his intervention in the physical world is unnecessary, then divine prophecy is either impossible or unlikely. If prophecy is impossible or unlikely, then prophecies in the Bible were most likely added after the fact. If the books are of multiple authorship, then all of Scripture must be questionable because most of the books claim, or give the impression, to have been written by singular authors. Seventeenth-century deistic philosopher Thomas Hobbes believed in the great antiquity of the Torah (the first five books of the Bible) and in Moses as its author, but Hobbes assigned late dates to at least five other Old Testament books. Jewish philosopher Benedict Spinoza similarly assigned late dates to many books, but believed the biblical prophet Ezra to have authored the Torah. Beginning with his 1780's work Einleitung, German scholar J. G. Eichhorn eliminated Moses as either author or compiler of the Torah. Eichhorn instead divided Genesis and part of Exodus into the work of two anonymous compilers on the criteria of whether God was addressed as Elohim or Jehovah (Yahweh). With great stubbornness, Wellhausen and his colleagues continued to reject the mounting evidence for the antiquity of Jewish writings. This rejection reflected the character in Germany which, at that time, was increasingly expressing a hatred of all things Jewish, including the rabbinical traditions in regards to the scriptures. Theologically, this stubborn and bitter atmosphere culminated in the German State Church and, later in the 1930's, the German Christian movement. This movement paralleled the rise of the Nazi movement and sought to completely purge the Bible of its Jewish aspects and references including, unbelievably, even the Jewishness of Jesus. Current biblical scholarship is utilizing all of the methods of dating outlined in the previous section. Although the modern researcher is still not without his or her own bias, the rabid anti-Semitism and archaeological infancy of the previous era are no longer the monumental problems they once were. 1) The anti-supernatural premise in the previous age by certain French and German scholars begged for anti-supernatural conclusions; this premise included bias against revelation, prophecy, and even belief in God. 3) Scholars critical of the Bible have been proven mistaken in assuming that any singular author could not refer to the Almighty by more than one title, or create a document with more than one theme. 4) The quick retreat to attribute any alleged discrepancy to a later author or compiler has proved unnecessary, thanks to a better understanding of ancient cultures and practices as being gained through modern archaeology. 5) Current scholars have additional ancient Hebrew writings with which to compare the scriptures which earlier scholars did not. Scholarship as late as World War II did not know of the material that we have today, including the Dead Sea Scrolls; one of the greatest archaeological finds of all time. 4.5 Dates of origin for each book of the Bible. As a culmination of modern scholarship, the link below is a chart listing each book and letter of the Bible with the approximate date, or date range, for each work's completion (not beginning). This chart is a compilation of research by the aforementioned scholars Archer, Harrison, and Bruce. 11 It is intended to represent the general consensus of many eminent scholars' lifetime studies and, therefore, is not intended to represent any single scholar's point of view. next: Is the Bible complete? What early manuscripts of the Bible exist today? Determining the age of the biblical documents confirms their historicity. It is also a first step in determining their authenticity (e.g., were these documents written when the authors claim they were written? ).